These work as well as the best electric curlers avsilable. Girls who love curls can get them in an instant with these hot rollers. The clips and rollers are both heated for extra hold, and infused with ceramic technology for better heat transfer. New Xtreme provides the fastest heat-up - 75 seconds! I love the size of these rollers because I have shorter hair (a little shorter than shoulder length). I had to search for awhile to find a hot roller set that had enough of the smaller rollers in it to use for all my hair. It heats up super fast, just a couple of minutes (it took 10 minutes for my older set), so it really saves time in the morning. It makes nice curles/waves. There is a spot for 3 clips to heat so your hair gets heat from the roller and the clip (which I like) but that is a problem also because the clips don't heat fast enough after you use the first 3....the first 3 are very warm but after that, not so much. If they only had a bigger spot to heat more clips than 3 at a time, this set would be super! I'm not sure how long the foam on the rollers will hold up but it seems to be doing good so far. I have always used electric rollersfor at least 30 years. When my old set died I bought these.The clips wouldn't hold the roller in the hair and the roller didn't grip the hair.I miss the old steel u-shaped picks that really held well. I don't care for the new clips or rollers at all . I'm very happy with this hot roller set. I love the heated clips - and they hold the rollers in place just fine for my thick, coarse, wavy hair. The set heats up very fast and I can take my hair down in 10 minutes and have all day curls! My one complaint is that I need a larger diameter roller than what is supplied. Didn't take a star away for this, because it is true of every roller set I've ever owned or even seen. 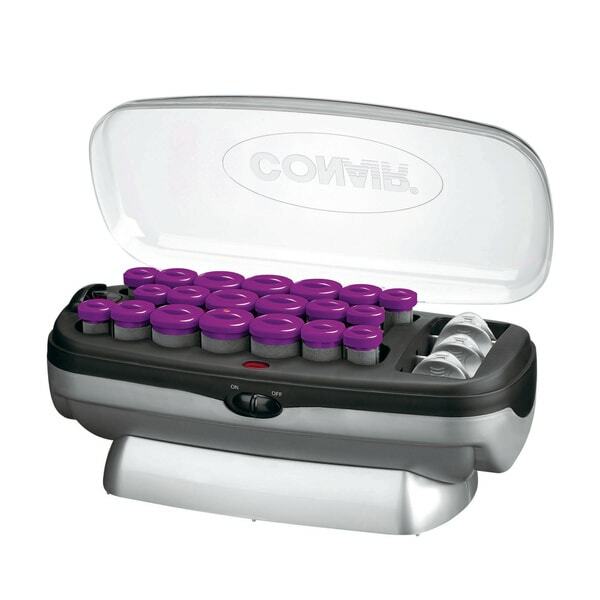 I love Conair and so purchased these rollers especially because of the fast heating. They are probably the worst rollers I've ever had. They don't heat well. They definitely don't curl well. The curlers don't stay in...The clips don't hold the curlers in. These things are going back!! I have tried several curling irons and heated rollers before but they weren't any good for my thick hair. To be honest i didn' t know what to expect from these rollers. When they first arrived i was sceptical however after my first try the results were amazing and I absolutely love the fact that you can heat up the clips as well. Ideal for thick hair- higly recommended. Great hot roller set, it did not take long to heat up and the rollers were not hot to the touch yet gave a great roller set. I would absolutely recommend this product without hesitation. Was so thrilled to find these! I used curlers like these for many years, then curled hair went out of style. Since my hair is naturally very wavy & thick, I like using this product bc it makes my hair look more finished. Curlers don’t snag hair, rollers get quite hot but cool off quickly, leaving lots of tousled curls! The huge problem I have with them is the clips! They’re not the wire kind that fit snug& kept curlers as far up as you wanted. These clips are supposedly heated, but they’re plastic & are supposed to wrap around the curler, but they do NOT fit when the curlers have hair on them! And they don’t stay put, I have to constantly roll them back up-& I have shoulder length hair! The “heated clip” function is useless. The curlers do get quite hot, so these faulty clips make handling the hot rollers VERY uncomfortable!! The end result tho, is pretty tousled hair! But if I can’t get metal clips, I’m done with this set. These are great, fast curls in less than two minutes. Curls last all day and even into the next day. The only thing negative I have to say about it is, if your hair is thin (like mine) sometimes it's a little hard to get your hair to stay on the roller , and there a bit heavy with the clip on so they have a tendancy to flop forward. The curls last much longer than doing them with a curling iron and they don't dry out your hair as bad either. Glad I got them! These hot rollers are great, it curls my dry hair in 10 minutes and is suitable for an active life style. I love this product but one thing be careful not to overheat the rollers for it can give a burning sensation. The rollers do not really get hot enough, the clips really do not hold my very thick hair. I have to wait for clips to get hot after using up the three from the clip heating area because there is only room enough for three. The clips are terrible. Don't hold and make big dents in your hair. Go to drugstore and buy the old fashioned wire clips. The clips do not keep the rollers in my hair and they were much smaller than I thought they would be. Super disappointed. Perfect for my busy lifestyle! A total of 10 mins from start to finish is all it takes. Add a bit of hair mouse, use your round brush and voilà, you have salon- styled hair! Love it!! The clips do not stay on the curler. I don’t care for them at all. I love this set of rollers, the clips are a perfect addition. Love these curlers. They heat up very quickly and are so easy to use. The curlers, clips everything is stored right in the case. My daughter in law was so in love with these, she got herself a set. These make using curlers easy and would recommend to all. "Does this set of rollers have an automatic shut-off. My old set of rollers is a Conair Infiniti with variable temperature control and auto shut-off features." Unfortunately, this item does not have an automatic shut off.